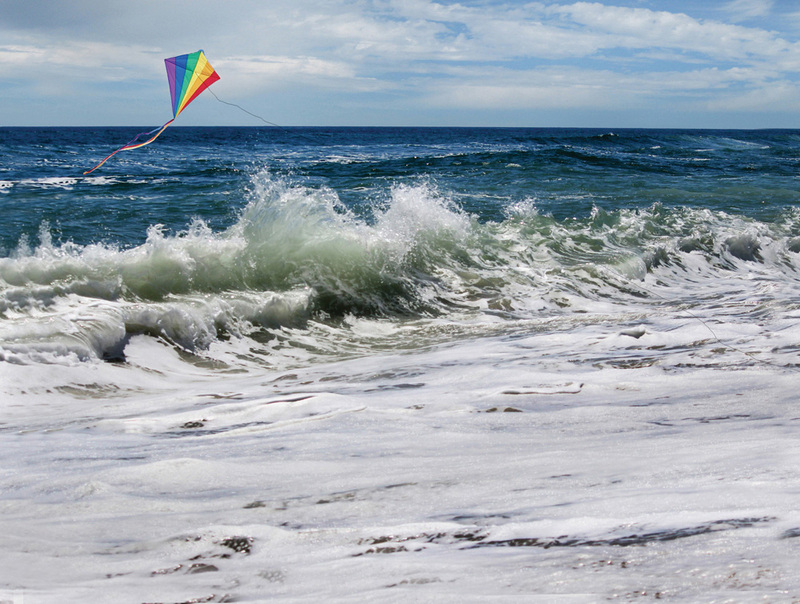 One of Maureen Ickrath’s photos depicts a kite flying over a crashing wave. 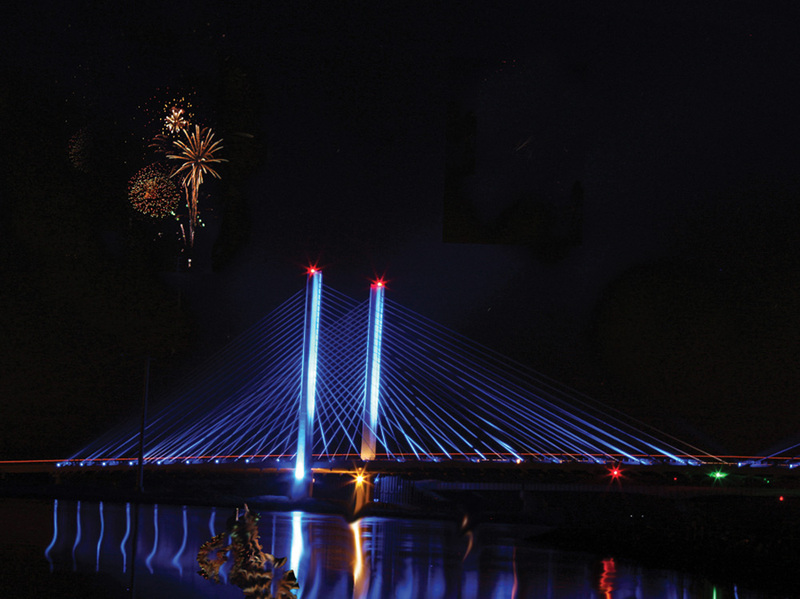 This Maureen Ikrath photo captures the Indian River Inlet Bridge at night, with fireworks. Maureen Ickrath has been sharing her art with others since she was a child — first “little sketches” that she used to draw for other children and, in recent years, photographs that capture the beauty of local beaches and towns. Ickrath, a resident of Bethany Beach, said her first real art instruction came at the same time she got her first camera. Her father had died when she was very young, she explained, and her mother remarried a man who was “an accountant and an artist — poor man,” and he was the first to encourage her artistic abilities. “He saw it in me,” she said. “He gave me my first camera, which was a little Brownie, and the first year after they were married, they gave me an easel and a ‘Learn to Draw’ (kit) with John Gnagy. Gnagy was famous in the 1950s and 1960s as the first televised art instructor. Ickrath said she would sit down every Saturday for her “art lesson” with him, focusing on “fine-line drawing” with its attention to the most minute details. During the course of her 30-year career doing marketing for Prince George’s Community College in Maryland, Ickrath taught herself a number of skills necessary for her job, including taking the occasional photograph, but she never took any formal photography classes. It was the camera, though, that became the ultimate expression of her artistic eye. Years passed between that first Brownie camera and Ickrath’s current photographic journey. “One day — I don’t know what it was — I just decided I’d really like to have a camera of my own. I’m telling you, once I got behind that camera — that was it. “To me, it’s instant art,” she said. “I love meeting new people and making a real memory for them — not just the photos themselves, but the experience,” Ickrath said. She also dabbles in wedding photography — but only beach weddings. She recalled that her first attempt at artistic photography was simply an effort to cheer up a neighbor. “When we moved here, my next-door neighbor, who was not feeling well — I brought her a little picture of the daisies that she loved to grow,” Ickrath recalled. 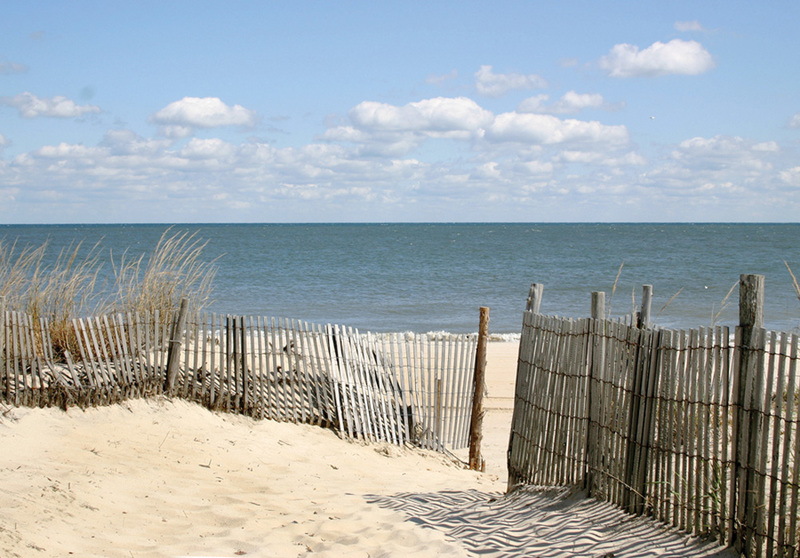 Then, another friend, former Bethany Beach Mayor and Bethany Beach Seaside Craft Show organizer Carol Olmstead, encouraged her to enter craft show, held on the boardwalk each June. Every year for the next 13 years, Ickrath set up her booth beside the ocean with dozens of other artists — a time that she treasured each year, she said. Ickrath said she enjoyed the fellowship with other artists, as well as the potential customers who she met. She said that over the years she also came to appreciate the people who organize art festivals like the ones she participated in in Bethany Beach. Although Ickrath said this will be her last time exhibiting at the Bethany Beach Volunteer Fire Company’s Artisans’ Festival, she is confident she’ll still find ways to connect with people who enjoy her work. “It’s very satisfying to know that you’ve created something that people love. I love it, and I photograph what I love, and to know that somebody else,” she said, gasping for emphasis, “has their breath taken away… It’s very satisfying,” she said. The Bethany Beach Volunteer Fire Company will hold its annual Artisans’ Fair on Saturday, Oct. 6, from 9 a.m. to 3 p.m. at the fire hall on Route 1 in Bethany Beach. Parking is free. Proceeds from the event will help fund equipment for the fire company. The fair features approximately 50 artists and crafters, with items for sale including photography, jewelry, pottery, glass and wood creations. There will also be breakfast and lunch items for sale, as well as baked goods. A 50/50 raffle will be held, as well as a “Chinese auction” featuring items donated by exhibitors.